The Golden Age of the postcard was from 1902 until the end of the Penny Post in 1918. Before the war there were eleven deliveries each day. The picture postcard reflected life at the front and at home. 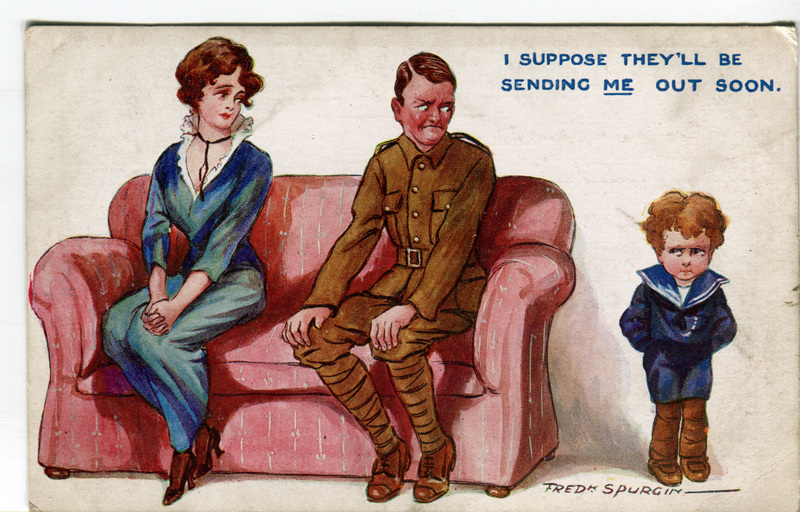 Patriotic images of Generals and Field Marshals, cards encouraging enlistment; a series of Donald McGill cards which parodied the men left at home. Sweetheart cards with sentimental verses; propaganda cards depicting blundering German soldiers; comic cards making light of life in the trenches; hand embroidered silk postcards made in France which were expensive at three times the rate of an average soldiers pay. The bland Field Service Postcard with multiple choice statements was introduced by the army as a quick way of getting a message home. Statements were crossed out as appropriate. The card was much parodied, and still is today. I am quite well….I have been admitted to hospital….I am being sent down to the base. All correspondence had to pass the censor, divulging your exact location was forbidden. A message on a postcard was like a text today, but the language was of the time, often upbeat and cheery: Hope this finds you in the pink, I am going along fine. 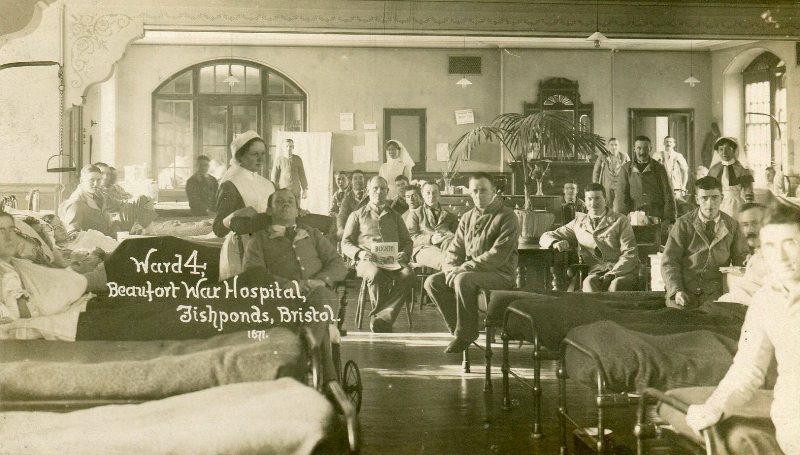 The Glenside Museum’s Beaufort Collection has over 200 images of patients and staff at the hospital from 1915 – 1918. Men in wards, in the grounds, in groups; pictures of the new operating theatres, the kitchens, and the laundry. These cards give us a glimpse of life at the hospital, but looking closer we can see men with bandages over their eyes and faces; amputees, men with arms and hands in slings. Sometimes the photograph unwittingly has also caught a look in the eye, a glimpse also of life at the front.